Posted December 9th, 2011 by Karl & filed under MailBigFile, MailBigFile News. This week has flown by (at least it has for me) and it’s time for us to share our top 5 with you. 1. Adobe Air Desktop App for Pro Users. 2. Wanted! Beta Testers for the new upload method! 3. From Address now added for free users, includes notification emails. 4. We’ve made it clearer not to reply to the notification emails. 5. We’re Sprucing up the Email Newsletters. Coming Soon – Adobe Air Desktop App for Pro Users. On the back of the Desktop App for free users that’s in development, we’re also looking into the possibility of an Adobe Air app for the Pro users, which is currently in the works by another member of our team. By using Adobe Air to create the app, we hope to add a drag and drop functionality to the program making the sending of files much simpler and more convenient. Of course, being a desktop app, this will also mean you won’t have to even up a web browser to access your account and send those all important files. Wanted! Beta Testers for the new upload method! Once the testing phase has been completed, we will then look to roll this out to all Business and Pro users. We’re hoping that a good majority of our customers should see an increase in their upload speed once this has been rolled out. New – From Address now added for free users, includes notification emails. As mentioned last week, we have now added the from field for the free service. 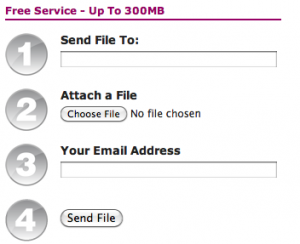 This now means that when you go to send a file, your own email address will also be needed to complete the file send process. When you do send the file, you will also now receive an email notification to state that you sent the file successfully. The recipient will now also be able to see exactly who sent the file to them, so that they may reply to them if they’re unsure of the content of the email that was sent to them. We recently had a few emails through from some users as they came to realise the reason they were not hearing back from their clients wasn’t because they weren’t replying, but because they were replying to our noreply address thinking it was going back to the sender. As a result, we’ve made it clearer on emails now not to reply to the original notification emails, as this will only go to our noreply address and will not be read. Hopefully this should stop correspondences from being lost. Course, if you’re ever worried that a reply has been lost to our noreply email address, you can always mail us in at support@mailbigfile.com and we’ll see if we can retrieve it for you. Service Update – We’re Sprucing up the Email Newsletters. We’ll also be making changes to the email newsletter template starting next month. We’ll be giving it a brand new look to make reading our newsletters a little more visually appealing.